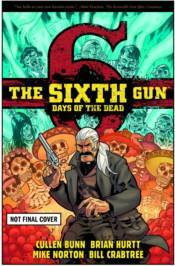 Roberto Vargas and Jesup Sutter will one day play important roles in the epic struggle to control the Sixth Gun. This is the tale that would shape these two--one an agent of the Knights of Solomon, the other a priest of the Sword of Abraham--into the men they will become. An ancient god of the dead is stirring, and diverse factions position themselves to profit from the awakening. Abigail Redmayne holds the secrets of this powerful creature in her hands, and a host of secret agents, necromancers, and the undead threaten to claim her body and soul.